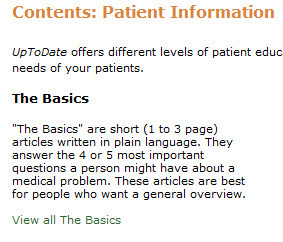 UpToDate, the evidence based, peer reviewed information resource for clinicians, now features The Basics, short (1-3 page) patient education articles written at a 5th-6th grade reading level. These easy-to-read guides are designed to answer the most important questions a person might have about a medical condition. You can find an information page on asthma, rheumatoid arthritis, osteoporosis, breast cancer, and more. At present available in English only. If your patients can read and assimilate information written at a high-school level, choose from the Beyond the Basics collection. Log in with your Villanova LDAP (email) ID and password. At the search screen, click the Patient Info tab. Learn how the new Health Care Affordability Act will affect your organization. Discover the 10 steps to success and get tips on designing an effective community needs assessment. The workshop will be held at the headquarters of the Public Health Management Corporation (producers of the Community Health Data Base) on January 26, 2011, 9:00am- 11:00am. PHMC is located at 260 South Broad Street, Philadelphia, PA 19102.